If you have a taxable income of Rs 5 lakh and above, it is mandatory for you to e-file your tax return. An average taxpayer should take roughly 30-40 minutes to key in all the information and upload his return. 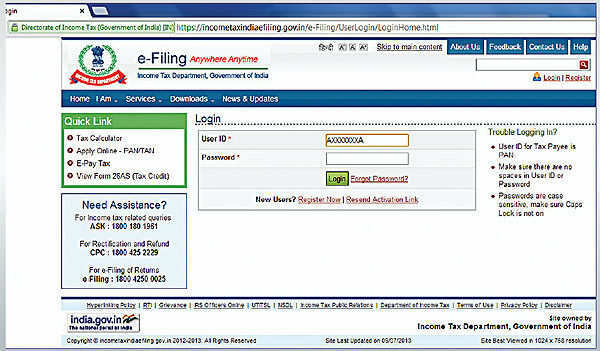 1) Log on to the Income Tax Department’s portal (incometaxindiaefiling.gov.in) meant for filing tax returns online. Register yourself using your Permanent Account Number (PAN), which will be your user ID. 2) Under the ‘Download’ menu, click on Income Tax Return Forms and choose AY 2013-14 as the assessment year if you are filing your return for the financial year 2012-13. 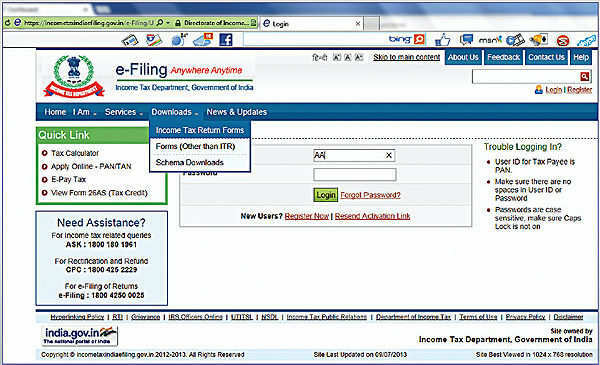 Download the appropriate Income Tax Return (ITR) form. 3) Open the downloaded Return Preparation Software (Excel form), follow the instructions, and enter all the details using your Form 16. If the form applicable to you is ITR 1 or ITR 4S, you can simply complete the process without downloading the Excel form by clicking the link ‘Quick e-file ITR’. Note that you will have to use Form ITR 2 if your tax exempt income exceeds Rs 5,000. 4) Compute the tax payable by clicking the ‘Calculate Tax’ tab. You may have to include other income, such as interest on bank deposits, NSCs, bonds and capital gains, in the calculation. This information will not be available in Form 16. If there is some tax due, pay the amount, and enter the challan details as well as the BSR code of the bank, in the tax return. 5) Confirm the details entered by clicking the ‘Validate’ tab. Proceed to generate an XML file, which will be automatically saved on your computer. The registration process (Step 1) can also be initiated at this stage. 6) Go to ‘Upload Return’ on the portal’s left panel, and upload the XML file after selecting ‘AY 2013-14’ and the relevant form. 7) You will be asked if you want to digitally sign the file. If you have obtained a DS (digital signature), select ‘Yes’, otherwise choose ‘No’. 8) Once the message regarding the successful e-filing is flashed on your screen, the process is complete. 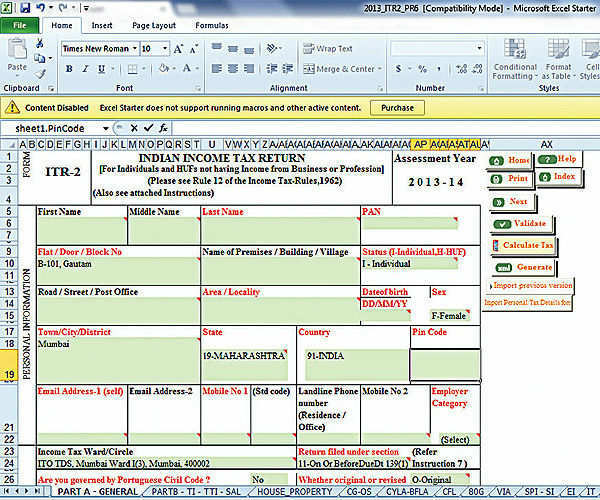 The acknowledgement form, ITR-Verification (ITR-V), will be generated and you can download the same. It will also be mailed to your registered e-mail ID. 9) Take a printout of the form ITR-V, sign it in blue ink, and send it by ordinary or Speed post to the Income Tax Department-CPC, Post Bag No-1, Electronic City Post Office, Bangalore – 560 100, Karnataka, within 120 days of filing your e-return. Couriered documents will not be accepted. 10) The I-T Department will send you the acknowledgement by e-mail, which is the final step in the process. 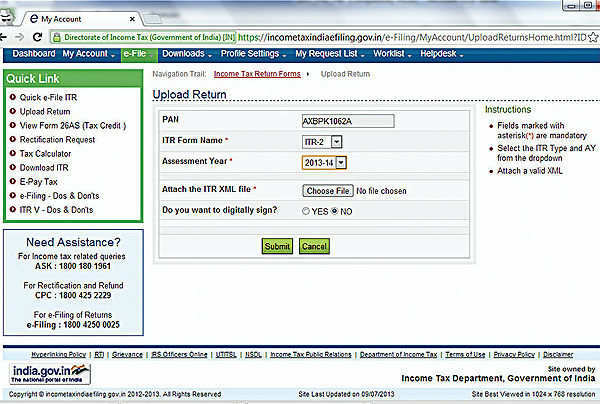 If you do not receive it in due course, you can send the form ITR-V again.